My horse would have won but she came up short! Now you show me yours. Trot back over on Saturday for the results. 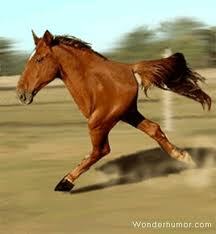 Sarah Jessica Parker heads out for her morning run. The real American Quarter Horse. The dark horse, Aftershock, got boxed in and Alvarez had to pull up harder than he expected to avoid a collision. Ticket holders were ecstatic when the filly came from behind to win by half a length. Professor Floxington comes in 16254th at the 1st and last annual all-LSD Olympics. Now that's what I call beating a dead horse. Is That Why They Call It The Rumpus Room?